He has shown regularly in New York and Los Angeles since the early 1970’s and is the recipient of numerous awards and grants including the National Endowment for the Arts Fellowship, John Simon Guggenheim Memorial Foundation Fellowship, and a prize from the American Academy of Arts and Letters. 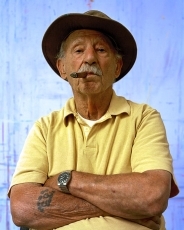 His work can be seen in the collections of the Metropolitan Museum of Art, New York, NY; Museum of Contemporary Art, Los Angeles, CA; Corcoran Gallery of Art, Washington, DC and the Whitney Museum of American Art, New York, NY. 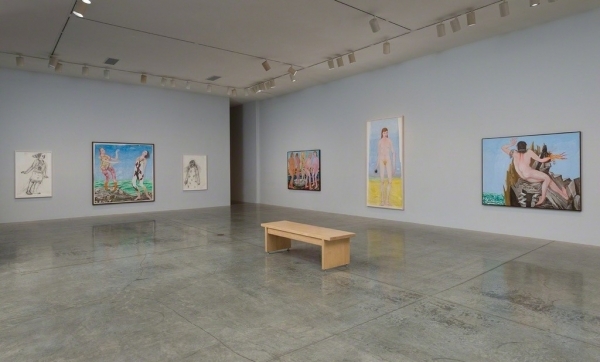 In 2011, Julie Joyce curated a comprehensive retrospective of Garabedian’s work at the Santa Barbara Museum of Art in Santa Barbara, CA. 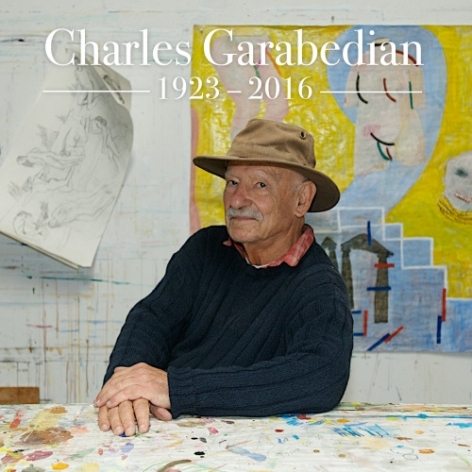 Charles Garabedian passed away on February 11, 2016 at his home in Santa Monica California. 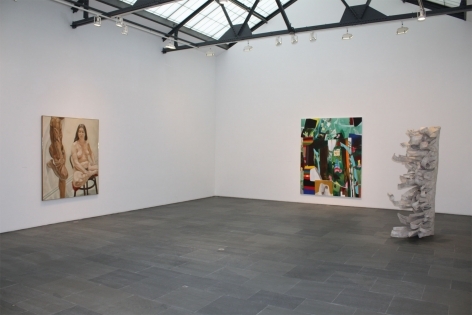 There is a small exhibition in memory of Charles Garabedian (1923 – 2016) currently at Sidecar, the adjoining annex space of Betty Cuningham Gallery on the Lower East Side. 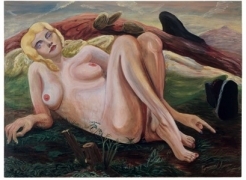 Consisting of one painting on each of the room’s three walls (the fourth is a large window facing the street), it’s a quick reminder of the long life and prolific output of a Los Angeles painter whose work was filled to bursting with light, color, and a ribald empathy for his fellow human beings. He stays above the fray throughout our conversation, telling the stories of the myths he loves and travel adventures with friends, rather than explaining the work or aesthetic decisions. “You are a humanist,” his wife Gwen calls out to him, when she hears us discussing his personal relationship to Greek tragedy. 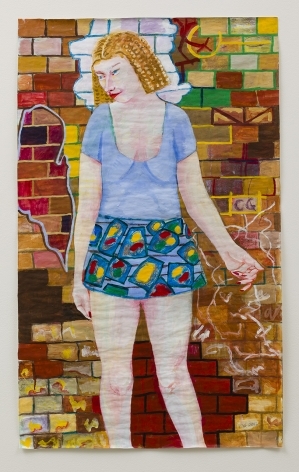 Garabedian is humble but ambitious; the figures in his paintings are monumental but gawky – relatable heroes and heroines. It is hard to imagine the work of Dana Schutz, Judith Linhares, and Francesco Clemente without Garabedian’s example, although Garabedian would never claim to lead any school; he is too busy with the challenges and fun of the daily work, even at age 91. 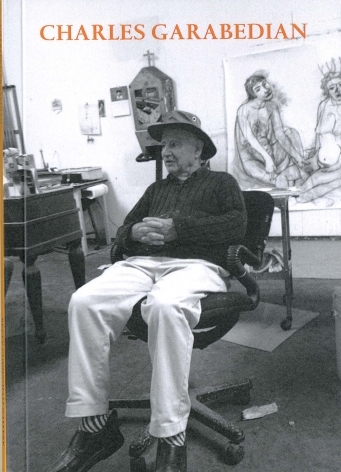 We are sad to convey the news that artist Charles Garabedian died on February 11, 2016, at the age of 92. The cause of death was prostate cancer. In deceptively cheery colors, 91-year-old artist Charles Garabedianreimagines famous tales of woe from classical mythology, where murder, torture, and madness abound. 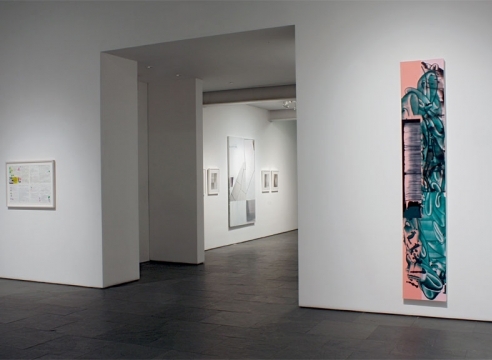 “Sacrifice for the Fleet,” now at L.A. Louver, hosts a series of new and recent works born from the artist’s fascination with Greek literature, Biblical texts, and Armenian manuscripts (he is the son of Armenian refugees). A proponent of so-called “Bad Painting,” Garabedian’s paintings possess an illustrative quality, with raw figuration and garish hues. 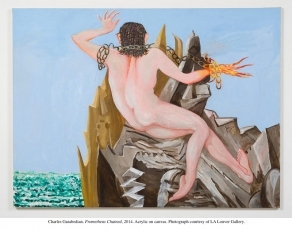 If you've never seen works by Los Angeles based artist, Charles Garabedian, let me warn you before you step into LA Louver Gallery to see his latest exhibition. Garabedian's paintings and drawings illustrate dramatic and painful moments of Greek mythology and Christianity. And most of his characters are naked, frightened and rather ugly. Big debuts make headlines, sell art, and often change the culture. Michelangelo sculpted the David before he turned 30, John Keats died at 25, and Mozart was composing by age 5. But creative men and women, from J. M. W. Turner and Paul Cézanne to Philip Roth and George Eliot, often produce their greatest work after middle age. Is experience—in life, in art, in love, and loss—necessary to create works that stand the test of time? 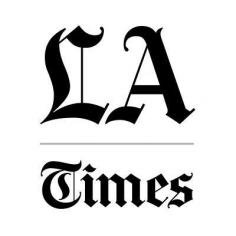 The new exhibition at L.A. Louver pays a special tribute to the “idiosyncratic and compelling” art of Charles Garabedian, one of the best known Los Angeles artists, who sadly passed away last year at the age of 93. 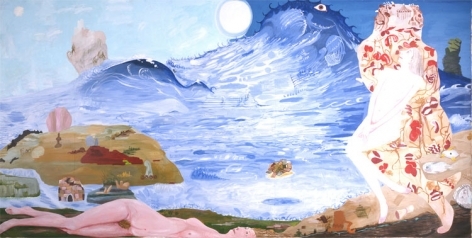 I first encountered Garabedian’s work decades ago and I was immediately amazed by his ability to evoke the spirit of Greek tragedies in monumental paintings inspired by Homer’s epics. There is something tragic yet naïve about his 1991 painting Study for the Illiad, populated by endearingly clumsy naked figures of men and women: standing, stumbling, falling, and laying down. 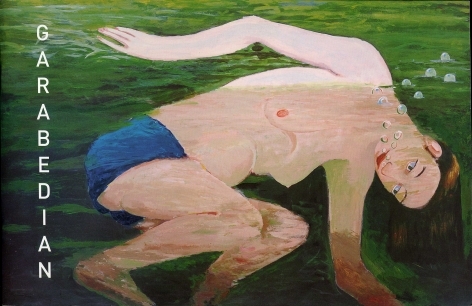 Charles Garabedian presents Mythical Realities at Betty Cuningham Gallery. 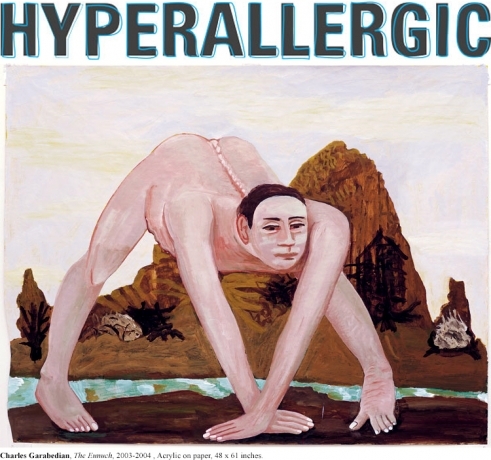 This is Garabedian's fourth exhibition with the gallery. Mythical Realities is the combined title for the nine large works on paper that compromise this exhibition. Garabedian is a believer in the collective unconscious, and continues to gravitate intuitively to imagery and narrative of his ancient Armenian ancestors. Ever since the avant garde went the way of silent movies, many of the most interesting artists of the last century have cast themselves as lone wolves — solitary souls whose genius is tied to the freedom that comes with being a go-it-alone misfit. 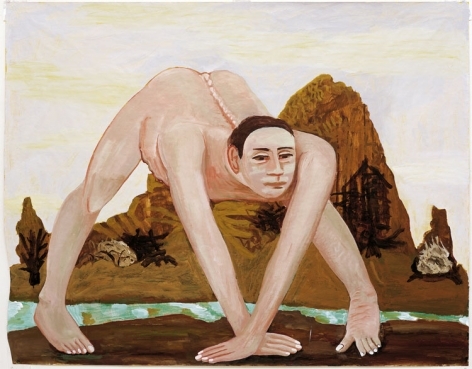 It's hard to overlook the akwardness of Charles Garabedian's exhibition at Betty Cuningham Gallery. Seams and wrinkles in the canvas, ill-framed images, and inarticulate brushwork are all evident.